In 2013, I traveled with the Knoxville Choral Society to Ireland. 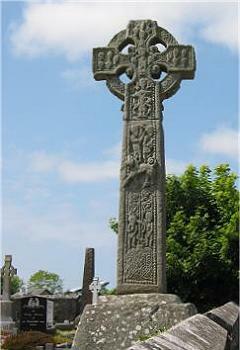 One thing that I really wanted to see were the Celtic High Crosses, a national symbol. The beauty of these crosses, either modern or traditional, were scattered throughout the lush green land of Ireland. In Drumcliff, County Sligo, was an 11th century cross, just across the road from the burial site of W.B. Yeats. Legand has it that St. Patrick added the nimbus to the Christian cross to help the Irish people better understand Christianity. There are many hymns that embrace the cross. “When I Survey the Wondrous Cross” by Isaac Watts, seems appropriate for the Easter season. A time to realize the wonder of the cross and the sacrifice that God gave to the world, His son, Jesus. When I survey the wondrous cross, On which the Prince of glory died.